Across the country, growers are firing up their greenhouses and germination chambers. It's time to start some seeds! Here at Johnny's Selected Seeds, we start thousands of transplants for our Breeding and Trials programs. In this article, we'll tell you about the pros and cons of the three main seed-starting systems we use. 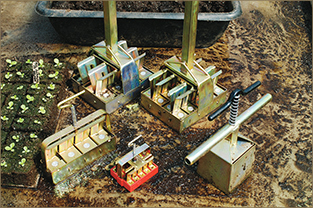 Indoor seed-starting techniques vary, depending upon the grower's goals, needs, and experience. Here's an overview of the three systems we offer, and what works best at the current scale of our Research Farm in Albion, Maine, so you can experiment and determine which method is best to start your own professional-quality seedlings. 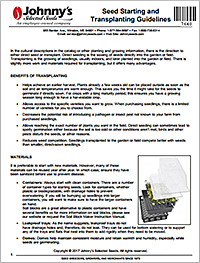 Molded plastic seedling trays are known as 1020 trays because their dimensions are approximately 10 inches by 20 inches. Easy to fill, transport, reuse. 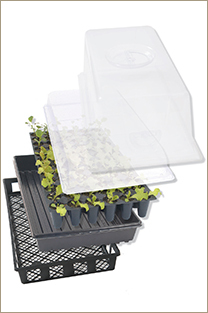 Cell flats (also known as plug flats) fit inside the 1020 seedling trays, leak-proof trays, or lightweight mesh trays, and are available in multiple sizes, identified by the number of cells in each flat. 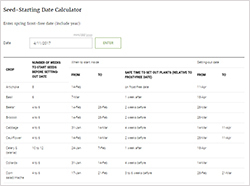 The most common cell-flat sizes for veggie transplants are 50's, 72's, 128's and 200's. The cells in these flats are square and very closely spaced, to maximize the number of plants you can fit in your greenhouse. For larger crops, there are cell flats with 38 or 24 cells per flat. The cells are larger, allowing for larger root balls, and the cells are round and spaced farther apart to allow for greater canopy development of the plants. Another option is the 20-row seed flat, in which seeds are sown in channels to germinate, then "bumped up" or "potted up" into cell flats when their first true leaves appear. Seed flats are advantageous because they conserve seedling heat mat or germination chamber space. Many growers consider this to be the most efficient way to start large numbers of seedlings at once. They are very quick to fill. They can be moved around easily. They are appropriate for use with mechanical transplanters. They are reusable for many seasons — if handled carefully and stored out of direct sunlight. Disadvantages. Plastic trays and flats need to be stored and cleaned before they can be reused. In addition, seedlings can become root-bound in the plastic cells, and there is some transplant shock when plants are removed from the cells. And, they will eventually wear out and need to be replaced. For sanitizing trays and as a means of disease prevention in your seed-starting program, we recommend a peroxide-based bleach substitute like OxiDate, which is an OMRI-listed disinfectant approved for use in certified-organic agriculture. Due to the scale of our operation, we primarily use 1020 trays for greenhouse propagation and seed starting. Lettuce is seeded directly into 200-cell flats, two to four seeds per cell. Flats are covered with vented plastic domes, allowing for humidity and temperature adjustment. The domes are removed as soon as the seeds germinate, and plants are thinned with scissors to one seedling per cell. Peppers and Tomatoes are started in 20-row flats, covered with plastic lids, and set in a germination chamber. As soon as seedlings begin to emerge, the lids are removed and flats remain on the heat mats until all seeds have germinated. When the cotyledons are fully developed, the seedlings are transplanted into 50-cell flats. Cucurbits — Cucumbers, Melons, Pumpkins, Squash & Watermelons — are seeded directly into 50-cell flats, with two seeds in each cell. Plants are thinned with scissors to one per cell as soon as possible after full emergence. Flowers are started in 20-row seedling flats and bumped up into 38-cell flats. Johnny's sells two brands of biodegradable pots: Fertilpots and CowPots™. These are individual containers that can be planted along with the seedlings. The pot then breaks down in the soil, allowing roots, water, and nutrients to pass through it. Advantages. Biodegradable pots eliminate transplant shock and they are super-easy to plant because the plants don't have to be removed from the pot. They also don't leave behind any hard-to-recycle plastic waste. That makes them popular with home gardeners, so commercial transplant growers often use them to give them an edge in plant sales. Fertil Pots are OMRI-listed and appropriate for certified-organic operations. CowPots are made from 100% composted cow manure, which adds some inherent fertilizer to the soil as it breaks down after transplanting, and stimulates root growth. Disadvantages. The disadvantages of biodegradable pots include the fact that they need to be replenished each season; they require some kind of carrying tray; and they are not as space-efficient in the greenhouse. 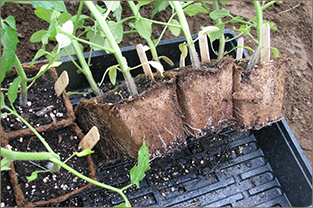 As with plastic pots, seedlings can become root-bound prior to transplant in the pots. Easy to use, reliable results, faster growth. Soil blocks are cubes of potting media that have been created by mechanical forms called Soil-Block Makers. Seedlings grow in a free-standing block of growing medium, rather than in some type of container holding the medium. Several different sizes accommodate different crops, similar to cell flats. Small, ¾" mini-blocks serve a similar function to 20-row seed flats for germination and potting on to larger blocks. Interchangeable dibbles can be used to make a small round seed hole, a deep round hole, or a square hole to accept mini blocks within a larger block. Advantages. Soil blocks can produce excellent plants, thanks to the "air pruning" that occurs when the tips of the seedling roots grow to the edges of the block and dehydrate, triggering growth of secondary roots which then spread until they reach the edges. This cycle repeats, resulting in a robust root system spread evenly throughout the entire block, allowing the seeding to establish itself very quickly once transplanted. Disadvantages. Soil blocks are much more labor-intensive to make, compared to the time required to fill flats and pots. This can make them a less cost-effective system for larger growers or anyone pressed for time. That sums up the basic pros, cons, and supplies required for the 3 main indoor seed-starting methods we use at Johnny's Research Farm to support our Breeding and Trialing programs. Depending upon your own goals and expertise, you may find it most useful to replicate these simple methods, or to modify them to suit your needs, or to develop your own seed-starting techniques. Whether you're a budding home gardener or a seasoned grower, Johnny's offers seed-starting supplies and seeds, along with informational support, to serve your seed-starting success. 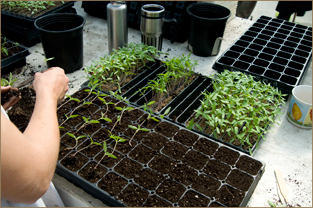 Potting on is the process of starting seeds in small blocks, then transplanting the growing seedlings into successively bigger blocks. Easy to Use: Wet soil mix. Push block maker down. Turn and lift. Set into tray and release… Voilà!